But let that only be a beginning. You could use this technique for so much more like Colleen did. Please share with us any new ideas you have for using this template. You could even make blocks different sizes using other rulers you own once you got the technique down. Please let me hear from anyone who had done other things with this technique. 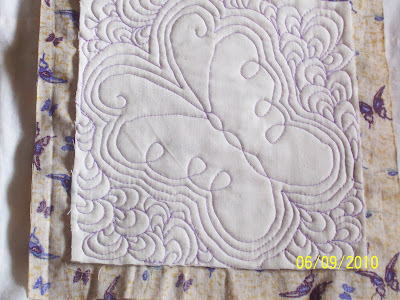 I personally completed one of these quilts in flannel with a scrappy back. I made every mistake possible and will be sharing those with you at a future post. I also found some helpful tips in putting this quilt together. 1. Don't use flannel on the back unless you don't mind struggling with bulk. It is not impossible, but would be much easier in regular cotton. 2. Use the same color on every backing piece for your first one. This will give you much more ease of construction in that you won't be matching up corners so much. 3. 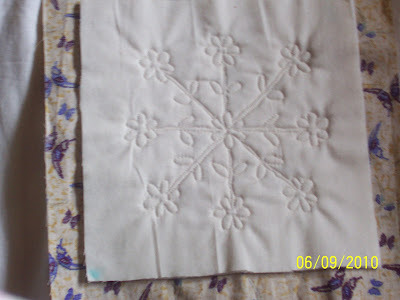 Mark your inside square on the backing piece for stitching the pieces together. I did alot of struggling with this. 4. Don't use polyester batting. It will slide all over the place. I even glue basted this, and it still moved around on me. Come back for a construction tutorial in about the next two months. I will do a pictorial, as I have to put one together for my guild, so I will post that here by September. Awesome,going to check this out! Yes just getting ready to sew a square and realized no mention on what kind of thread? 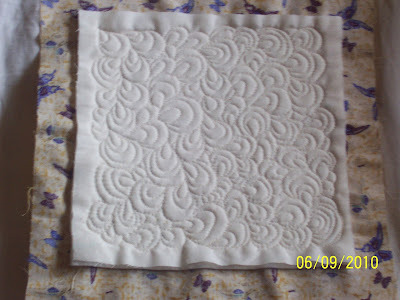 Do we use the quilting thread? Not sure where you mean here. There are many threads suitable for quilting. You may however use 50 wt cotton, the same as your stitching.